Raw tuna at “Miyako” in Tsukiji Market. Tsukiji Market is one of the popular attractions in Tokyo both for locals and foreigners. 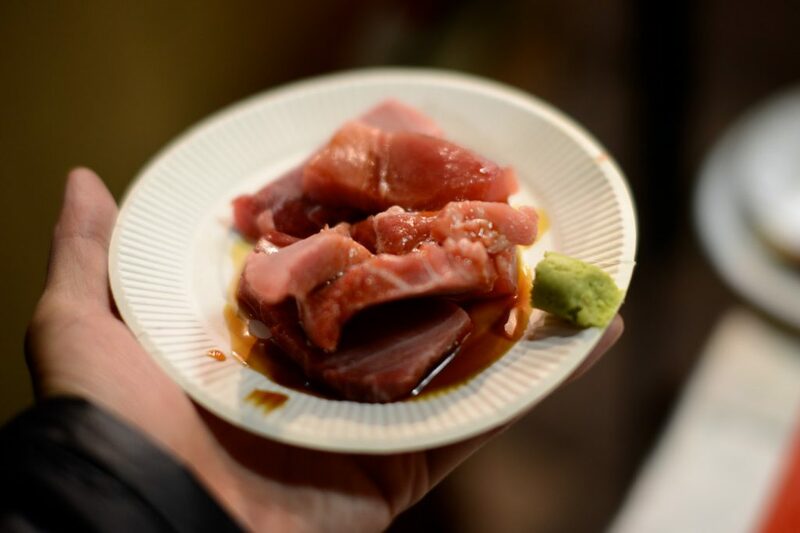 It’s called “Japan’s Kitchen” where seafood in massive quantities and qualities, and chickens, as well as vegetables, are traded. 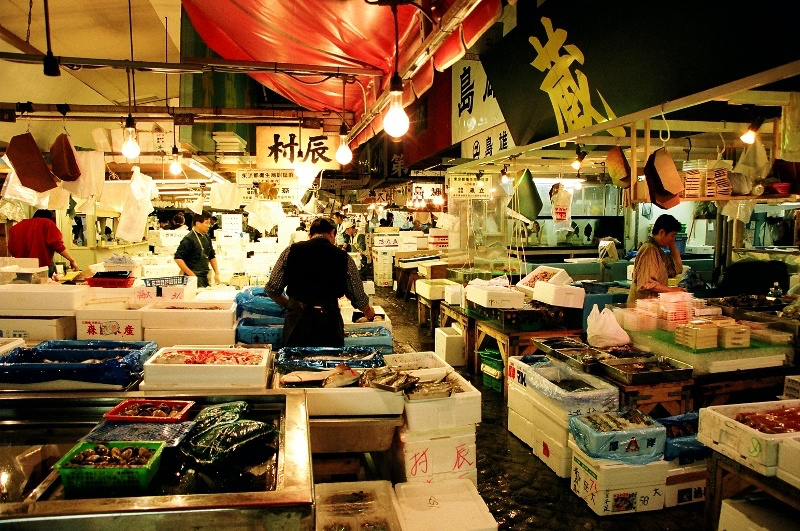 Due to its transaction volume, it’s the top wholesale market in Japan, and the top fish market in the world as well. Let’s dive into this diverse fish market to enjoy the atmosphere and delicacy with 5 shops we selected for you! 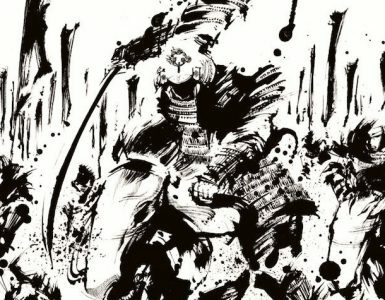 In 1657, Edo (Old Tokyo) was devastated by the Great Fire of Meireki, and the Tokugawa shogunate decided to fill in the coastal area of Edo. Using advanced civil engineering, the land was reclaimed from the Tokyo Bay and named Tsukiji (築地), which literally means constructed land. 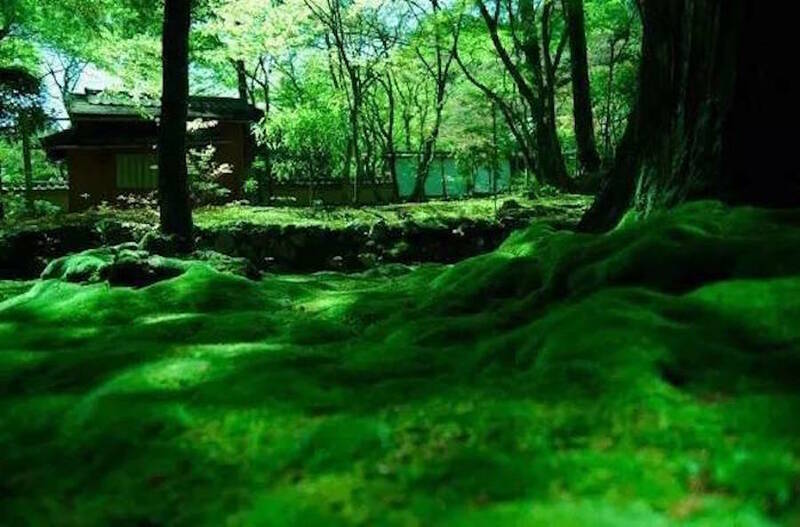 The place used to be quiet with only shrines and homes for Samurai. Then in 1923, the Great Kanto Earthquake destroyed much of central Tokyo, including the Nihombashi Fish Market. 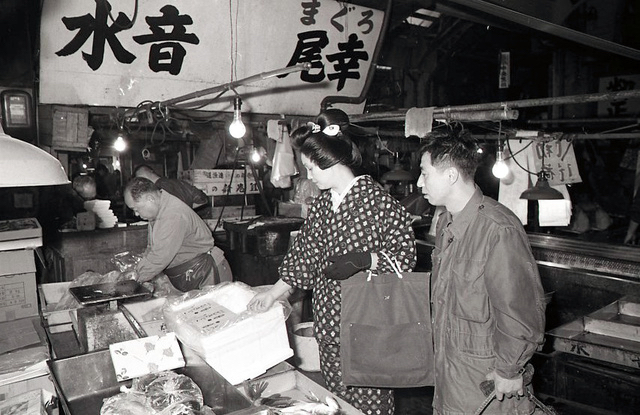 The fish market was then relocated to the Tsukiji District and began its operations in 1935, making Tsukiji a prosperous and bustling town. Handling over 2,000 tons of marine products per day. 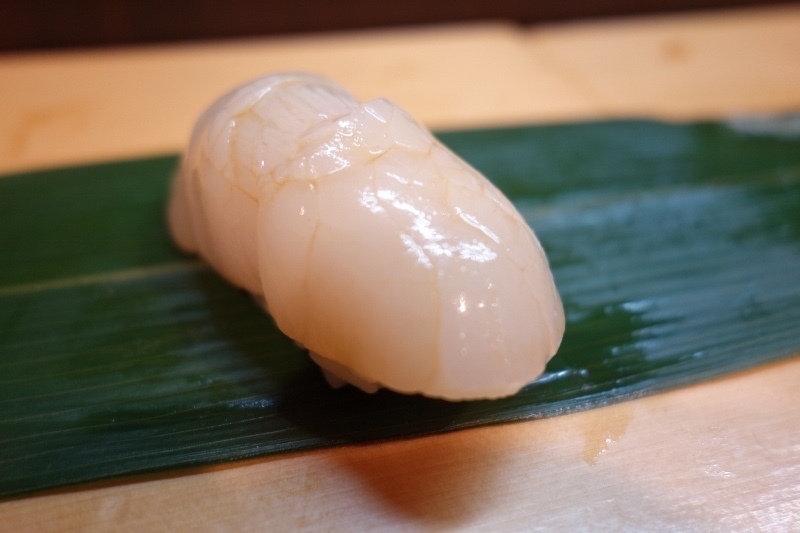 The market is expected to close and move to a new site in Toyosu in the near future (the move was originally scheduled for November 2016, but then delayed indefinitely by the governor). The Tsukiji Market is separated into two main areas: the Inner Market (Jonai Shijo) and the Outer Market (Jogai Shijo). The wholesale area consists of hundreds of small stands in a large, crowded hall, where buyers and sellers hurry along narrow lanes with their carts and trucks. Visiting the wholesale area sounds exciting, but tourists are encouraged to enjoy the Outer Market since they tend to interfere professionals’ business due to its narrowness. Restricted numbers of visitors are allowed to watch tuna auction, though. The Outer Market retails some of the fresh seafood and vegetables sold in the Inner Market. The Outer Market consists of a few blocks of small retail shops and restaurants crowded along narrow lanes. 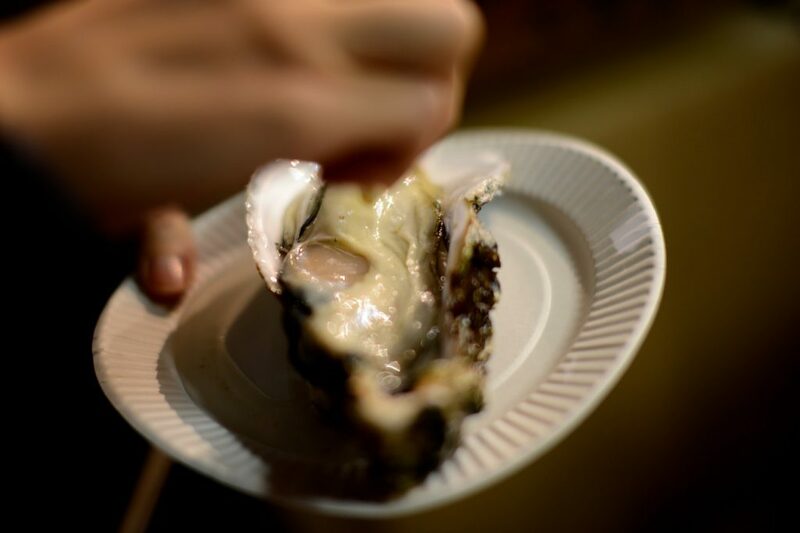 We focus on this Outer Market where you can find all sorts of food related goods, knives and fresh seafood and produce for sale in smaller (than wholesale) portions. There are some sushi restaurants where you see a long line of people at the Inner Market; 2 or 3 hours-waiting time is not unusual here. Here we will introduce you where you can grab something delicious without a long wait! 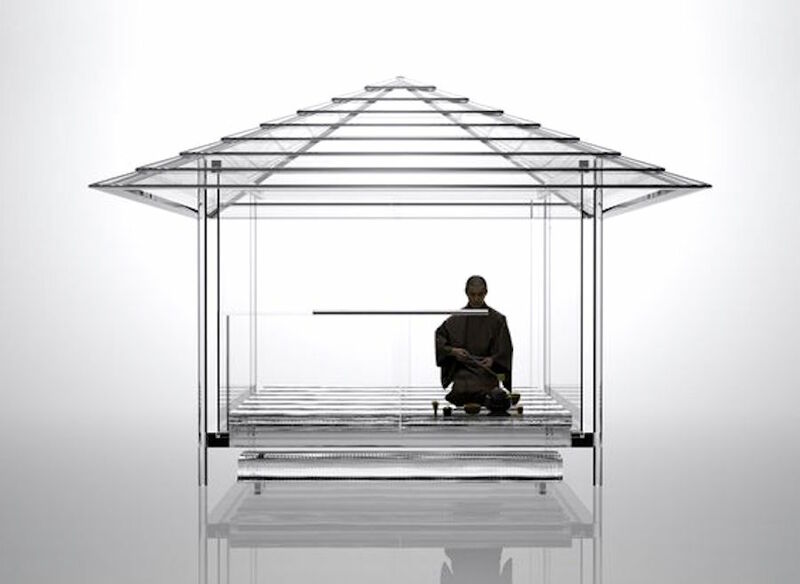 You can eat delicious sushi standing. Okame is located at the edge of the market. 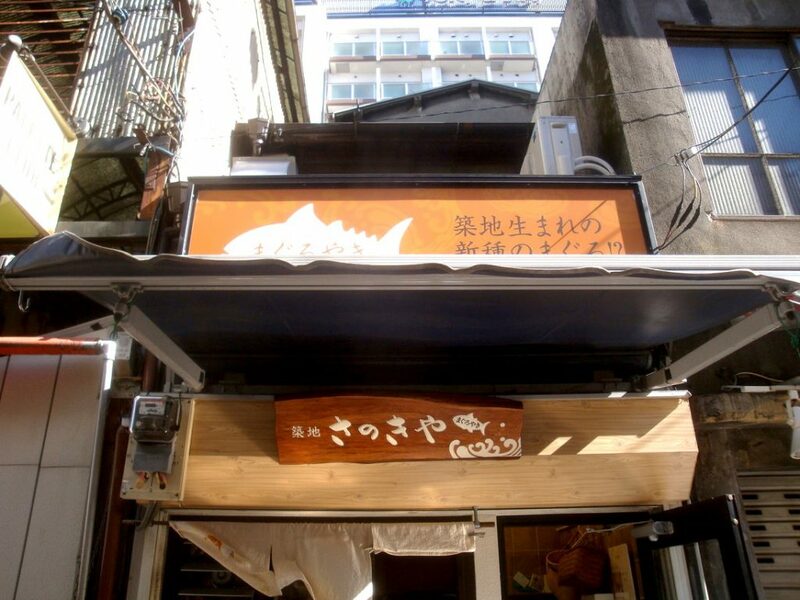 This is the spot you can enjoy sushi casually while enjoying the atmosphere of Tsukiji. 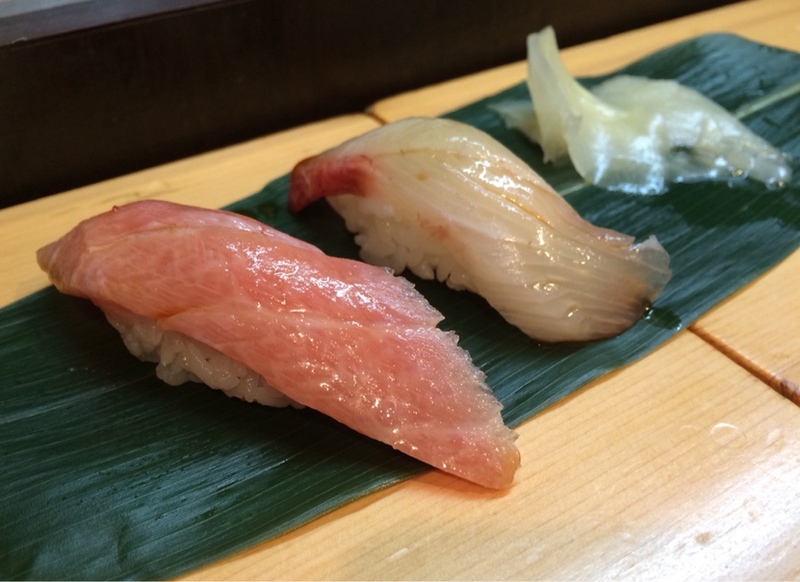 There is another Okame sushi restaurant in Tsukiji, but this one is for standing-up-eating. Seafood on soured rice is relatively bigger, you can try many kinds of seafood without stuffing your stomach. 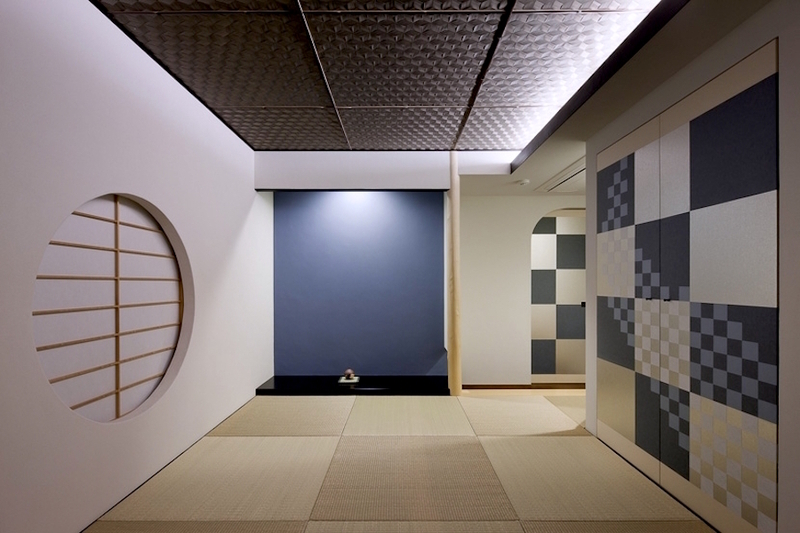 The shop is pretty narrow and accommodate about five people at once, but this is the style Edokko (Edo people) liked. Sushi is originally Japanese fast food. You grab favorite ones, then off to the next destination. Why Ramen near fish Market? It’s for workers who finish their job, they eat this simple, clean and delicious noodles before going back home. 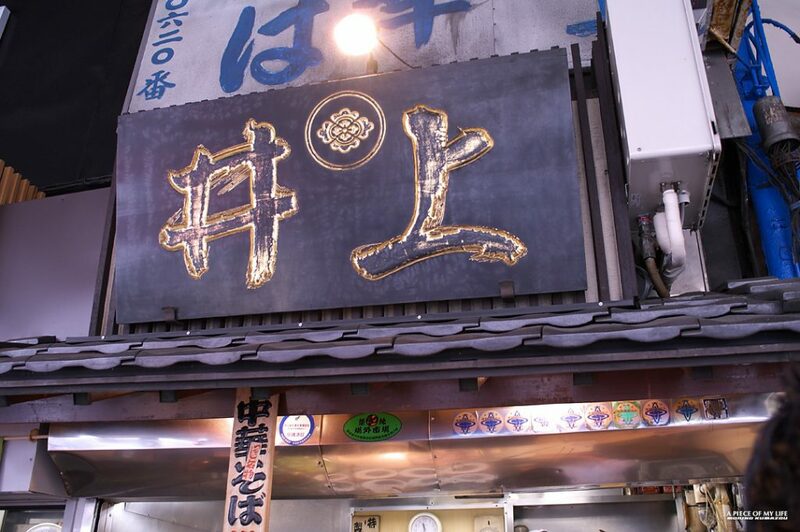 Inoue is one of the oldest and popular ramen shop in Tsukiji. There are thousands of ramen shops in Tokyo which are truly good, but what makes this shop unique is its soup. 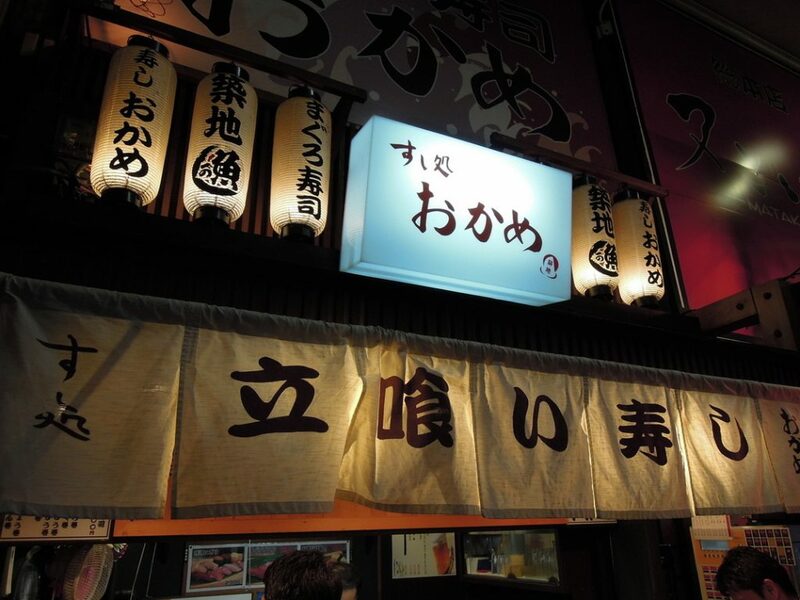 They serve only one menu “chu-ka soba”, which is really tasty, but not oily nor heavy. You won’t feel bloated up after you finish your bowl. Therefore, you want to come back again. 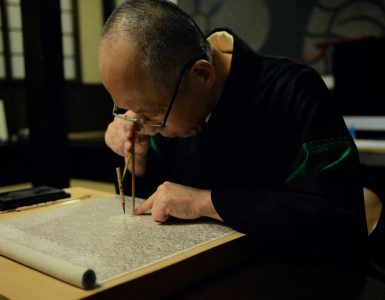 Elderly people can relate to the image of ‘good old ramen’ to the bowl they serve in Inoue. Thin noodles with Chinese-style barbecued pork. If you want to try not fancy, but traditional ramen, this is the place for you. There’s no seat, so you eat standing. Make sure you prepare yourself with a comfortable clothing, especially, in the early morning or winter time you should add a warm clothing. You will find it pretty easy with a big gold sign of 「井上」 on a black board on Shin-Ohashi St.
UPDATE (April, 2018): Due to the fire on August 3, 2017, Inoue was burnt down along with other 7 stores. 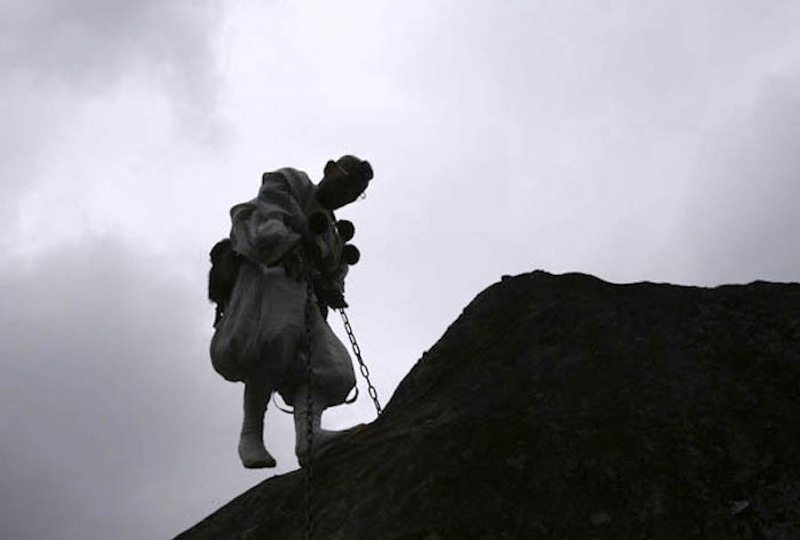 It’s specified Inoue was the fire breakout source (the overheat of the conduction of the stove) and at this time (April, 2018), we are not sure whether it will open again somewhere. This is where you can eat fresh tuna, scallop, urchin to name a few. It’s a pretty quick fix on the street! 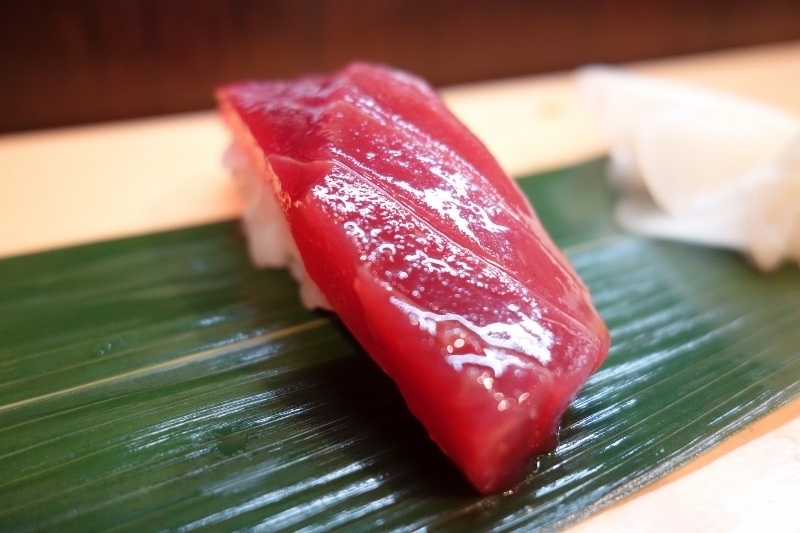 You can’t beat fresh raw tuna or oyster with a little dip of soy sauce! Also you can enjoy Kaisen-yaki (grilled seafood) for 1000 yen, which is pretty much bargain when you think ordering other other single menus. 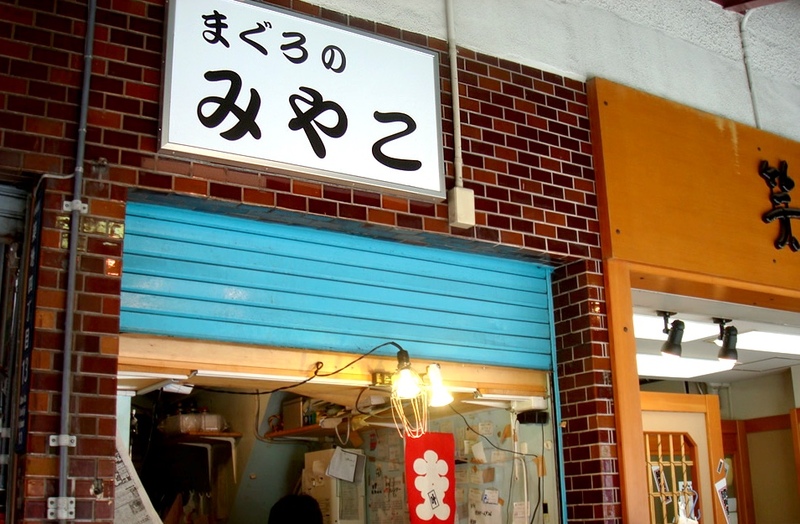 They roast surface of the seafood with two hand burners, if you like, you can purchase canned beer from the shop. 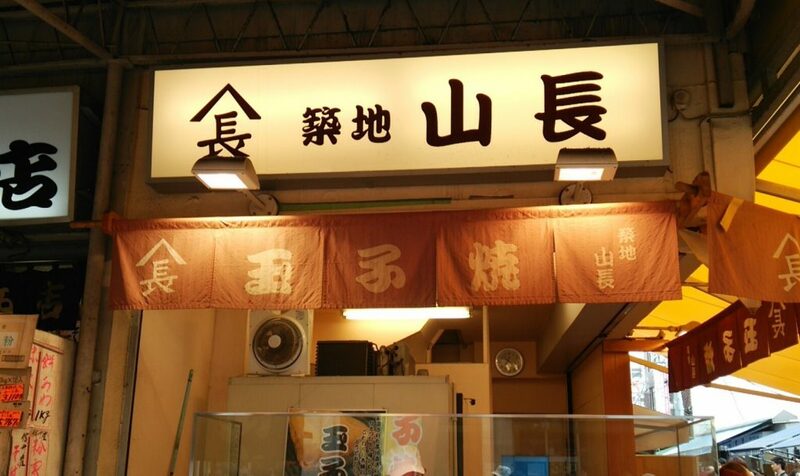 It’s a popular rolled egg shop where professional buyers all over Japan buy their products.They used only finely selected fresh eggs, katsubushi soup, salt and sugar. 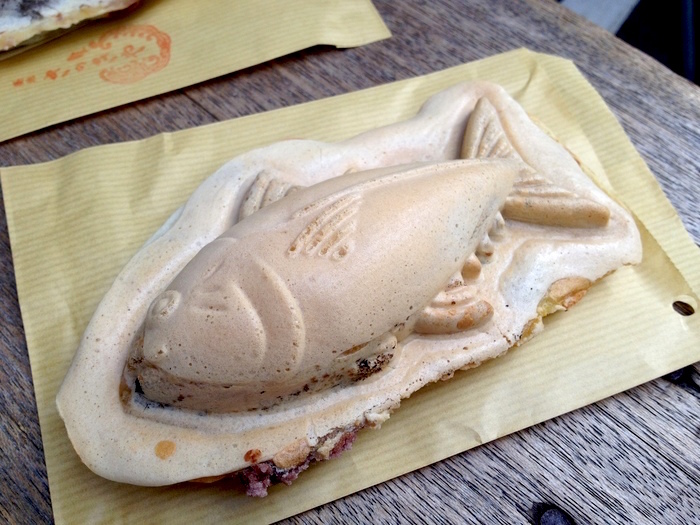 Tai-yaki sea bream-shaped cakes are common, but this shop sells maguro-yaki tuna-shaped cakes. 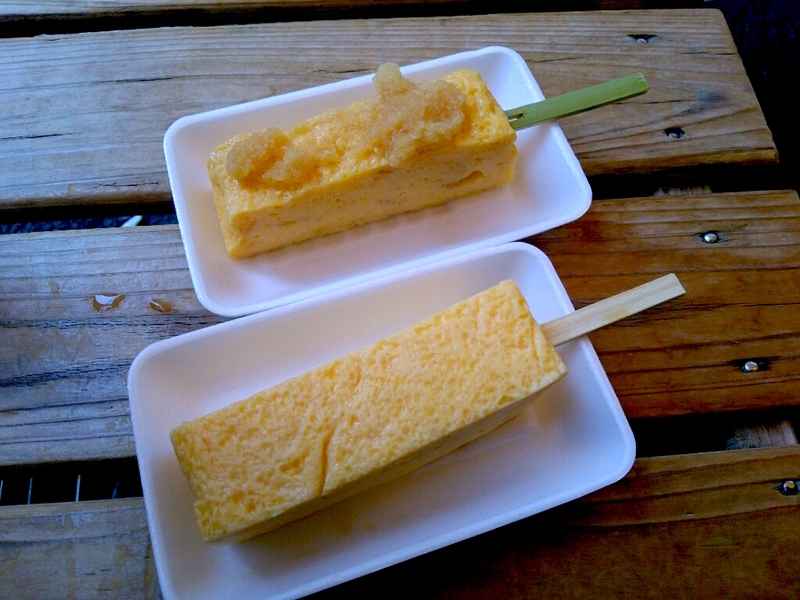 Its looks are similar to tai-yaki, but oh so different! They provide only two types of sweets here. The maguro-yaki have more densed sweetened red bean inside and the outer ice cream corn like stuff is crispy! You can enjoy the softness of sweetened red beans with Chu-toro, with sourness of apricot in it. Try them both and enjoy different combination of texture and taste! 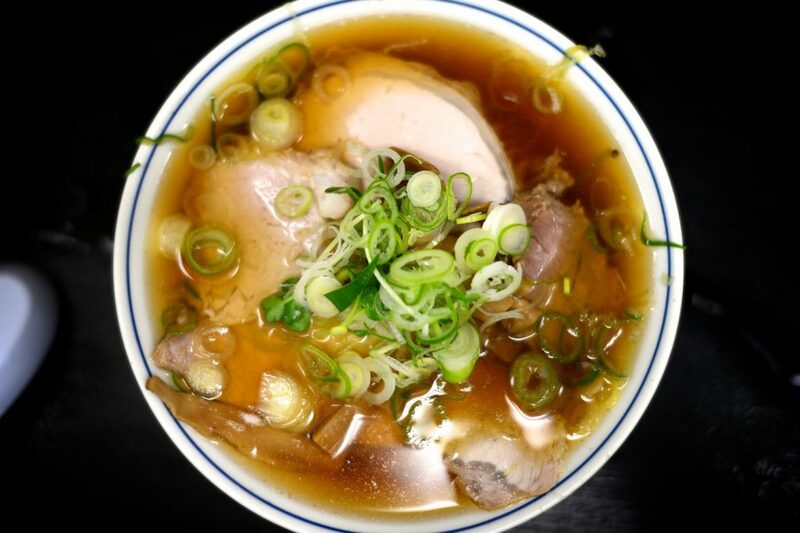 This is not the place to eat, but it makes a great gift to your gourmet friends or for yourself to cook authentic broth to go with other Japanese food! It comes with kind of ziplop bag, you should put the bag in the fridge once you open it, so you keep them fresh longer. 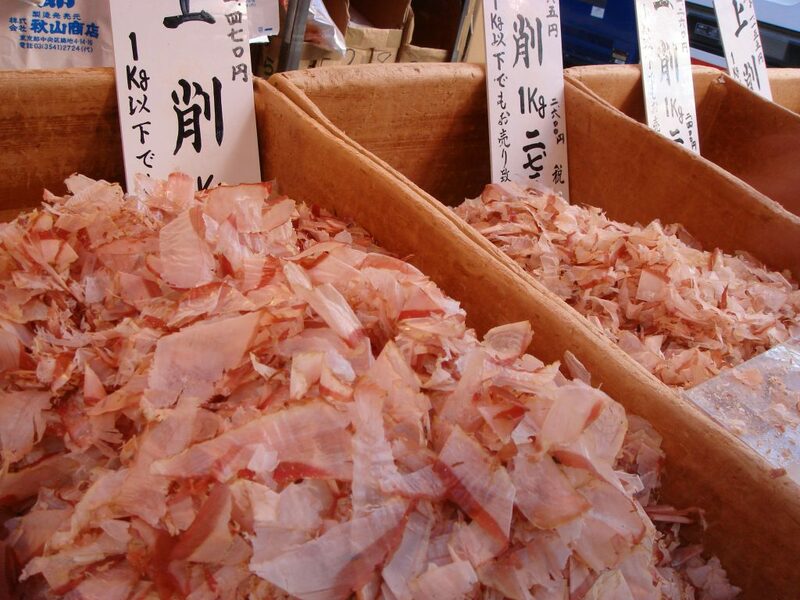 Protein (essential amino acids), phosphorus, kalium (potassium), vitamine D, calcium, minerals are found in katsuo-bushi in abundance, which have amazing health benefits. 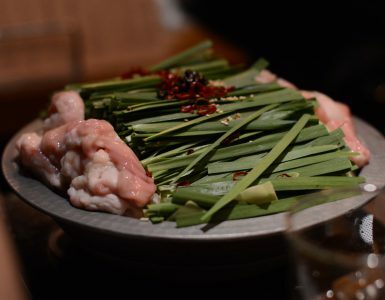 You can taste katsuo-bushi in every traditional Japanese cuisine. 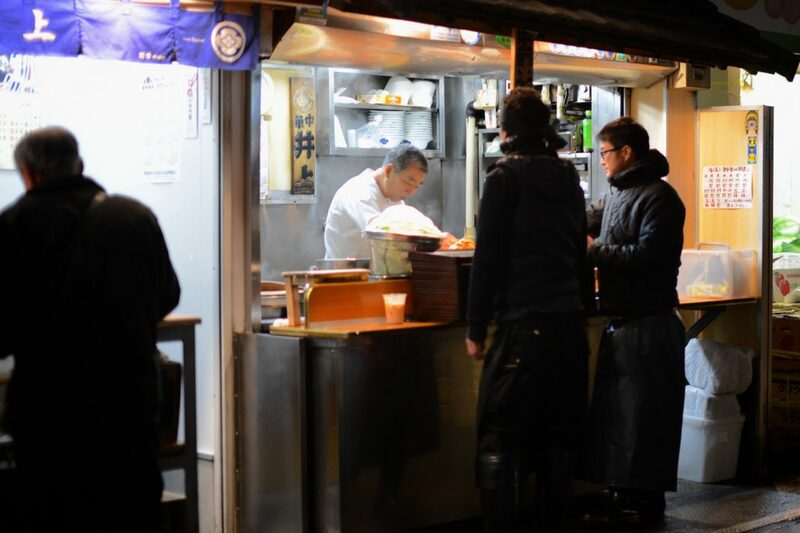 Many ramen stores use it as their main ingredients for their original soup. 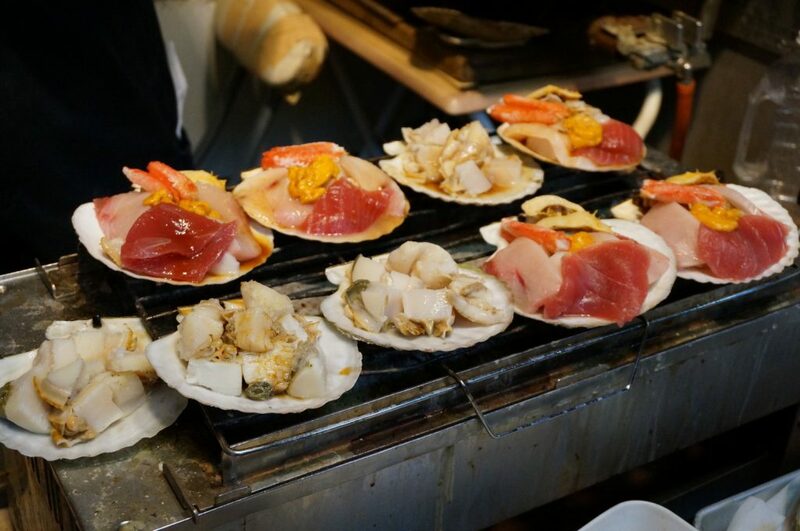 Although Tsukiji Market is well-known for its fresh fish, it offers wide varieties of food you can enjoy immensely. You can’t see all the shops you want to visit at once, so come visit as often as possible as your schedule allows. With these 5 shops we selected here, you can eat them while you walk, it makes the best snack for you to explore deep Tsukiji! 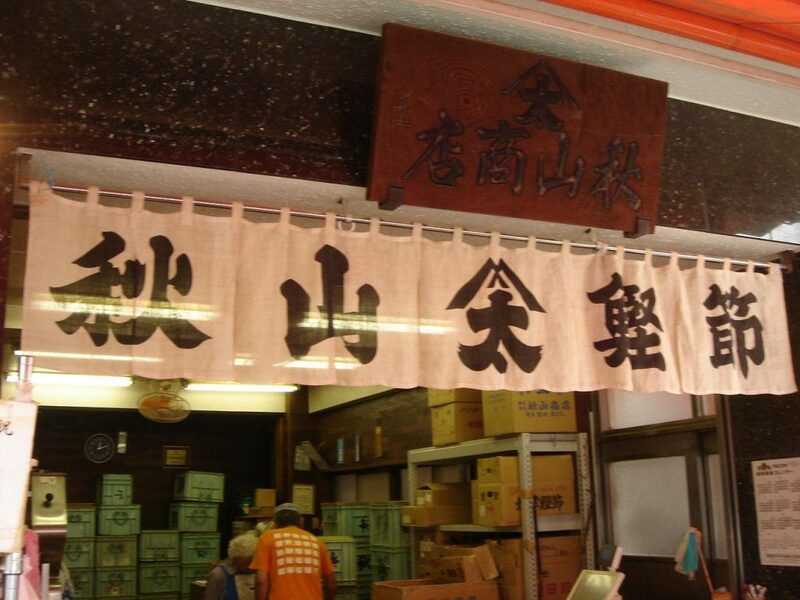 Let us share the wondrful article, 100 YEAR-OLD TOFU SHOP THRIVE IN TSUKIJI by John in Kyoto. Can you believe they opend in the year that Queen Victoria died and Theodore Roosevelt became the 26th President of the United States of America? What we can be sure is the taste of the tofu should be something different from the ones we get from the supermarket. It’s a great addition to our “go-to list” in Tukiji!